Morchella, the true morel, is a genus of edible mushrooms closely related to anatomically simpler cup fungi. These distinctive mushrooms appear honeycomb-like in that the upper portion is composed of a network of ridges with pits between them. If you are a first time hunter, you should make your first hunting expedition with someone who knows what a good morel looks like. These ascocarps are prized by gourmet cooks, particularly for French cuisine. Commercial value aside, morels are hunted by thousands of people every year simply for their taste and the joy of the hunt. The fruit bodies of the Morchella are highly polymorphic in appearance, exhibiting variations in shape, color and size; this has contributed to uncertainties regarding taxonomy. Some authors suggest that the genus only contains as few as 3 to 6 species, while others place up to 50 species in the genus. Phylogenetic analysis based on both RFLP and restriction enzyme analysis of the 28S ribosomal RNA gene support the former hypothesis, i.e., that the genus is comprised of only a few species with considerable phenotypic variation. Morels grow abundantly in the two and sometimes three years immediately following a forest fire. However, where fire suppression is practiced, they may grow regularly in small amounts in the same spot year after year. Typically they are found in moist areas, around dying or dead Elm trees, Sycamore and Ash trees, old apple orchards and maybe even in your own back yard. Ground cover varies and it is very likely that each patch of mushrooms you come across may be growing in totally different conditions. Commercial pickers and buyers in North America will follow forest fires to gather morels. The Finnish name, huhtasieni, refers to huhta, area cleared for agriculture by slash and burn method. These spots may be jealously guarded by mushroom pickers, as the mushrooms are a delicacy and sometimes a cash crop. Morels have not yet been successfully farmed on a large scale, and the commercial morel industry is largely based on the harvest of wild mushrooms. Morels are a feature of many cuisines, including Provencal. Though morels are typically sold dried or canned, they can be purchased fresh. When preparing fresh morels for consumption, soaking them may ruin their delicate flavor. Due to their natural porousness, morels may contain trace amounts of soil which cannot be washed out. One of the best and simplest ways to enjoy morels is by gently sauteeing them in butter, cracking pepper on top and sprinkling with salt. Many people dry out the morels for long term storage. When they are ready to eat them, they simply soak the morels until they reabsorbe moisture. Often, these mushroooms are not nearly as good to eat as if they were fresh. Other people freeze or can their mushrooms. For those who love to cook the morel mushroom is a delicacy. The elusive morel can be found on Drummond Island in the Spring. Most are found around Corned Beef Junction. You do need to be vigilant in your search as there are false morels that can make you sick; but the rewards of finding the true morel is worth it. 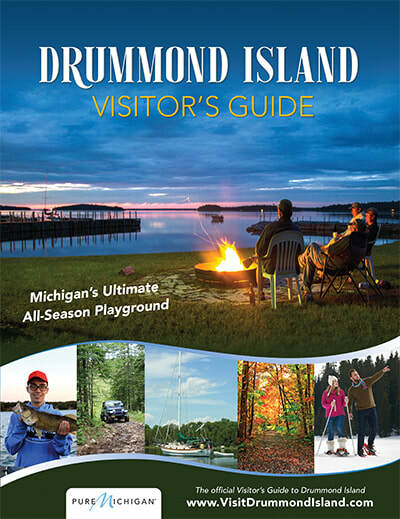 Drummond Island has both the white and black morel mushrooms. Morels are only found with a trained eye and persistence. Usually the best time to harvest the morels on Drummond Island is Mother’s Day weekend. So to the person who appreciates the morel, I suggest bringing your Mom for a fun weekend; start by taking Mom out for breakfast at any of the nice restaurants on the Island, followed by a fun day of hide and seek with the morel mushrooms. 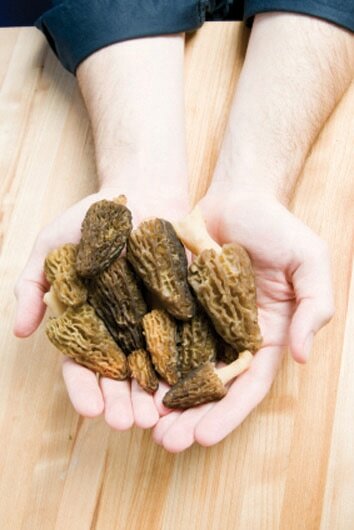 Then you can enjoy making dinner with your delicious fresh picked morels back at your cottage. As the weekend comes to an end you can see how much fun the family had and look forward to making this a family tradition.